Indianapolis hardwood and tile store Kermans knows that when it's time to shop for new floors, homeowners have a list of features in mind. More and more often we are seeing customers ask for floors that are durable and easy to care for. Today's busy lifestyles don't always have time for floors that require regular in-depth cleaning. If you're looking for floors that will look great for years to come and are easy to clean - look no further than Kermans selection of wood and tile flooring. Carpets reign as a cost-effective floor choice but when it comes to keeping a floor looking like new, hard surface floors such as wood or tile win hands down. In fact, if you have a busy home with lots of foot traffic, you might find that a hardwood floor is more cost-effective in the long run than a carpet that needs to be replaced fairly often. 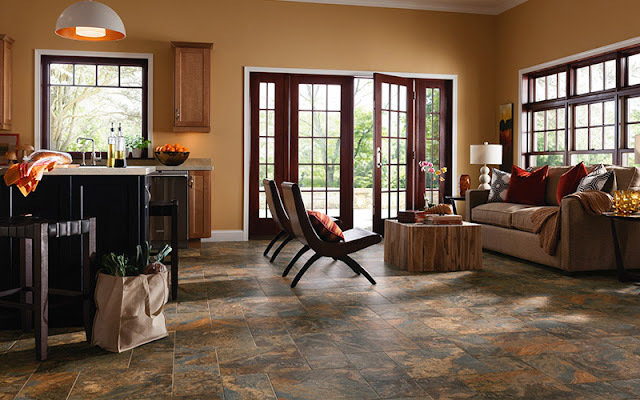 Why are more and more homeowners turning to hard surface floors? Easy to clean: Hard surface floors such as hardwood, ceramic tile, porcelain tile or luxury vinyl don't hold onto stains or spills, mud or water, dirt or debris. There's a lot to like when it comes to an easy cleaning floor. Beautiful range of choices: Have a specific look in mind? You won't be disappointed by the range of choices with hard surface floors. If you want a warm wood floor you can look at natural hardwood, wood-like porcelain or even waterproof luxury vinyl tile - all of them give the look you want but with slightly different characteristics and prices. Looking to bring nature indoors? Look at natural stone tiles or porcelain tiles that mimic a wide range of more expensive natural materials. The options are really endless when it comes to hard surface flooring. Better for your health: If you have allergies or asthma, carpet can literally be bad for your health. Many people with breathing issues notice a dramatic difference in the way the feel when they make the move to hard surface flooring. Hard floors don't trap dust and mildew - two of the most common irritants for people with allergies or asthma. There are so many choices when it comes to hard surface floors that it can be hard to narrow down the list of options! Do some investigating now and then stop by our Indianapolis flooring store to see samples for yourself. We promise you won't be disappointed in our selection. Stone-look luxury vinyl: Resilient tiles that carry the visual attributes of natural stone. 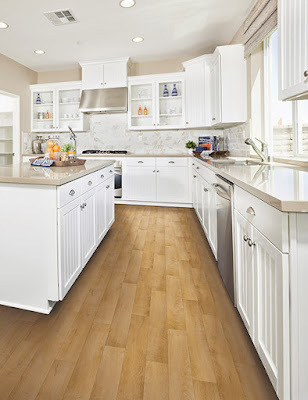 Wood-look luxury vinyl: Resilient planks that mimic the appearance of hardwood but with easier maintenance.